The Alaskan Husky is very athletic with big thighs. They have brown or blue eyes, sometimes one of each. Alaskan Huskies have deep slim chests and long legs. Playful, energetic Alaskan Huskies were born to run. 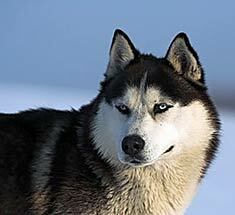 The Alaskan Husky weighs 44 - 66 lbs. Alaskan Huskies have heavy undercoats which helps them cope with the very low temperatures of their native habitat. Alaskan Huskies are generally reserved around strangers, they rarely bark, and generally tend to make yelping or howling noises. They are a clever breed but sometimes are picky eaters especially if there is only one dog. The Alaskan Husky is more reserved and calm than its Siberian Husky and Alaskan Malamute cousins; friendly toward its family and curious about others. Because they are positive toward strangers, they are not good watchdog material. 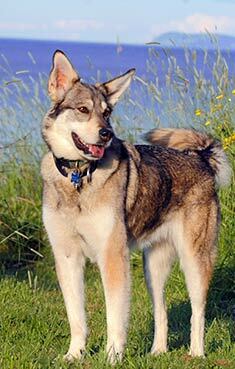 Alaskan Huskies are runners and need to be active in order to stay happy and healthy. Find Alaskan Husky Puppies with our Free Breeder search!